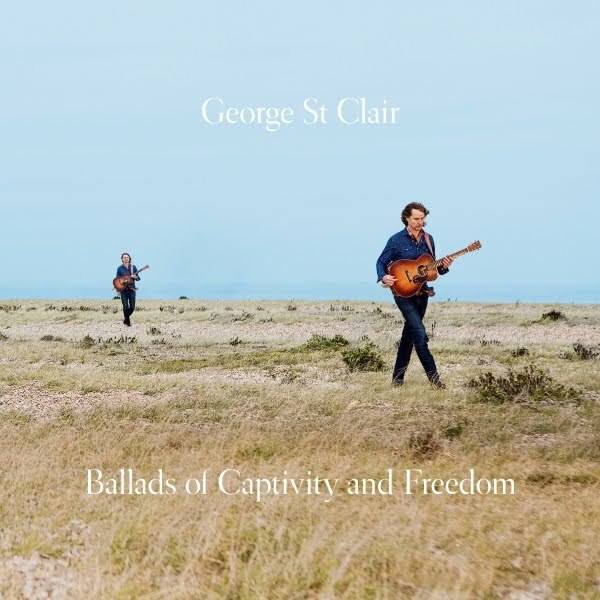 London, UK – Part western balladeer, part borderland chronicler, songwriter GEORGE ST. CLAIR is a master of conjuring feelings and images of lives past and present. Growing up on the high plains of Texas put George in touch with the vastness of the American West, and his songs evoke the dry deserts, rolling grasslands, and high mountains of his West Texas homeland. Living for the past several years in the UK has given him a renewed perspective on the land where he grew up, and these reflections take shape on his new album BALLADS OF CAPTIVITY AND FREEDOM. Although George is based in Europe, the album was recorded at Bird and Egg Studios in Richmond, CA, mixed by Ben Bernstein at Petting Zoo Studios in Oakland, and will release in stores and online worldwide March 2, 2018. GEORGE ST. CLAIR has known Ben Bernstein for many years as a friend, collaborator, and producer, and has long trusted his taste, musicianship, and technical expertise. To break the ice on their first recording session at Bernstein's Petting Zoo Studio, they laid down a quick demo of George’s song “The Places Where They Prayed,” with George playing Ben's vintage Gibson acoustic and singing into a single mic. It seemed to George that they were just getting started, but the initial bounce of the song didn't sound bad at all. George went back to his home in the UK and was floored when he later heard Ben's version complete with drums, bass, and pedal steel. The song came bursting through, sounding authentic and natural. After that George knew he wanted Ben to produce the whole record. Demos were sent, charts were made, and schedules were coordinated, and they got to work immediately upon George’s arrival back from London. Ben had since put together a great core team of musicians – Dan Lebowitz on guitar and pedal steel, Mike Stevens on drums and congas, and Ben himself on bass. He organized the main sessions in the grand live room at Bird and Egg Studios in Richmond, providing the space and equipment to set up as a live quartet. Steve Sarmiento, Ben's assistant, kept everything ticking and brought a relaxed air along with his technical knowledge. On the final day, Kirby Hammel came in to add great feel and fluidity on organ and piano, which turned out to be a key part of the sound on the forthcoming album. Experienced and prepared, the musicians got it right away, rehearsing and talking through minor adjustments. As with Ben in the studio, George felt he could trust this team implicitly. With only a few minor additions and adjustments in post-production back at Petting Zoo Studio, these live sessions comprise the new album BALLADS OF CAPTIVITY AND FREEDOM. GEORGE ST. CLAIR draws on influences from the western Country tradition, Mexican Folk, 1970s Rock, and Texas balladries to narrate hidden stories examining the struggles between Native Americans and white colonizers, and the various plights of migrants to the US. He grew up in and around places where vicious battles were fought over the possession of land, and where large numbers of indigenous people were corralled into encampments. His family background of ranching and wildcat oil prospecting spurred him to probe the more controversial history of that part of the world in his songwriting. With his own sound and point of view, GEORGE ST. CLAIR is a formidable writer who takes the listener to places and times where untold possibilities once existed, and still do. GEORGE ST. CLAIR cut his musical teeth in Austin, TX, playing Country, Flamenco, and Salsa, and co-founding the band Soniquete, a stalwart of Austin’s Alternative Latin music wave. However, it was while immersed in Latin American music that George’s ideas for melodies and verse still came almost always in the form of country ballads – a type of sound and feeling that was simply in his blood. GEORGE ST. CLAIR found his voice in heartfelt narratives about life in the American West. For over 20 years George has pursued a career as a professional archeologist and anthropologist, which involved living for extended periods of time in remote places in the American Southwest, Mexico, Peru, and Brazil. While in Mexico, his travels crossing and re-crossing the border further ignited his historical imagination and sharpened his awareness of life in the region. This path eventually brought George to London, where he got his PhD in Anthropology, followed by a few years of lecturing and research at the London School of Economics. All the while his reading, writing, and further reflection kept fueling a vision that would emerge in his songwriting – a nuanced, poetic voice full of wit and rigor, ever-grounded in his connection to home. While music was never far out of the picture, over the last few years the time came to put all his energies toward it. Bringing all his experiences together, songwriting emerged as the way for George to find his true voice.